This was long due. Brahmanand Singh has captured the life of the legendary composer R.D.Burman ( Affectionately called Pancham) in a documentary. The 4 min preview looks very tantalizing. Looking at the trouble he is having in getting it released through traditional distribution channels, would an online distribution model suit him ( Given the large fan base Pancham has worldwide)? I just downloaded Firefox 3 over the weekend. Its fast, cool, and upgraded in a minute ( I upgraded from the previous Firefox version). On that note, you may want to check these add-ons for Firefox. I intend to try a few of them over the next weekend. Cambodia is home to the magnificent temples of Angkor which are unmatched across the world for their brilliant architecture and artisanship. Today Cambodia is a developing country that is trying to match with its ASEAN neighbours, after years of devastation and carnage. The scars of the despotic Khmer rouge are slowly healing today , although there are still undetected land mines across rural cambodia. It is good to see Cambodia latching on to the information age with huge spurt in mobile phones and internet cafes that have mushroomed in the country. As a country with such a rich legacy, it certainly deserves better. HISTORY : Indians started arriving in Cambodia from as early as 2nd century A.D and exerted a powerful influence until the 14th century. Hinduism was a dominant religion then , which is why most of the Angkor temples ( including Angkor Wat) are dedicated to the Hindu Gods ( Mostly Shiva & Vishnu). The temples of Angkor that include the famous " Angkor Wat" were built by the Khmer kings from 8th to 12th century.Due to the Thai invasion in 14th century and centuries of neglect , the Angkor temples turned into ruins until they were discovered by the French in 19th century. Cambodia gained independence after world war II but fell under the rule of " Khmer Rouge" in the 70's. Its notorious dictator Pol Pot set the year back to " Year Zero" , abolished currency and started an ethnic cleansification process that left more than two million people dead. The atrocities of Pol Pot still remain as a scar amongst most Cambodians and its a shame that he died without being punished. With a coalition government now, Cambodia finally seems to be on the verge of recovery. GETTING HERE : Cambodia has two international airports - Phnom Penh ( The Capital) & Siem Reap ( Angkor) and is well connected to key Asian & international cities. Several international carriers including Air France, Malaysian Airlines, Silk Air, Thai Airways fly to Cambodia. Budgets airlines such as Airasia and Jetstar fly to Siem Reap too. Siem Reap is the closest town to the Angkor temples. VISA DETAILS : Most nationalities can obtain a visa on arrival ( including Indians , it costs US$ 20). I would highly recommend applying for a Visa online ( Its simple, very quick but costs US$5 more than Visa on Arrival). I got my online Visa in one hour ( amazing !!) and was able to avoid the uncertainty and long queue in the airport. Here is the URL for the Online Visa. If you have any issues in the online Visa ( such as photos failing to upload ) , email them and they will revert in a few hours. WHEN TO GO : Tourists flock year-round in Cambodia to see the Angkor temples. Cambodia has a typical tropical climate - hot and humid. The best time to travel is from Mid-Nov to January when its a little cool and without rains. March - May can be extremely hot and should be avoided. The rains start from June and last till September and could be quite heavy particularly in Aug, Sept. Be prepared to come with plenty of Sunscreen lotion since it could quite hot during most part of the year. Cambodia can also be quite dusty and filled with insects. As a caution, bring anti-allergy tablets and general purpose medicines. CURRENCY : The Currency of Cambodia is Riel . However, US Dollar is the "popular" currency and is widely accepted everywhere. Hotel Menu cards, shops, entry tickets are all priced in USD. Hence its not worth changing your US Dollar to the local currency. There are foreign exchange counters all over the main cities. At the time of writing, 1 USD = 4,000 Riels. LANGUAGE : Khmer is the the most spoken language in Cambodia. English, French are spoken quite haltingly in tourist places. Make sure that you speak English slowly and clearly when conversing with Cambodians. In the rural areas people speak only Khmer. LOCATION : Cambodia is in the ASEAN region and is close to Thailand & Vietnam. Phnom Penh is the capital . Most tourists come to Cambodia to see the famous Angkor temples which lie 8kms to the north of Siem Reap. Buses: There are hardly any public buses in Siem Reap and hence its not a preferred mode of transport ( unless you are relying on tour operators). Taxis : Taxis are not very cheap and are limited. Tuk Tuk : If you are budget traveller ( like me) , then Tuk-tuk is a great value. Indian cycle rickshaw + TVS Scooty = Tuk Tuk ( They tie a scooty equivalent vehicle to a rickshaw). It can seat 2-4 people and can be hired for $10/day ( including driver). If you travel to outskirts, then drivers may charge higher upto 15$ / day. Bikes : Perhaps Cambodia is the only country where you can rent a bike with a driver ! ( No you can't drive it yourself and need a local driver). These cost even lesser and can be hired for $5-7 / day. One time drop-off could be as low as a dollar. TIMEZONE : Cambodia is GMT + 7 hours. HOTELS : Hotels range from extremely cheap ( as low as $5 / day ) to really expensive. In my opinion, the Siem reap hotels are quite inexpensive and great value. You can either stay close to the Angkor temple ( Not recommended) or at the Old market area in Siem reap ( Close to restaurants, shops and night market). I stayed at the " Ta Prohm Hotel" near the Old market ( Psar Chas) area and would highly recommend it. It is very close to most restaurants (5 mins walk) and shopping areas. The staff are extremely helpful, courteous and make your stay pleasant. Its a 3-star hotel and cost me US$30 / night ( inclusive of breakfast). The rooms are really huge and clean and the TV has 100+ channels including some Indian channels ( SS Music, Zee, DD National). Though the breakfast is quite limited in variety, its still a great value for its sheer location. The restaurant at the hotel has some live bands playing on weekends and this might cause a bit of noise in the nights but nothing that is unbearable. Hotel rooms can be booked online through various travel websites ( I booked mine through Asiarooms.com). FOOD : Cambodia prides itself on the Khmer cuisine. Siem reap has a rich mix of French, Thai, Chinese , Mediterranean and Indian restaurants. Being a vegetarian can be a problem because of lack of vegetarain options in the Khmer cuisine (due to which the food can be quite bland). However, Siem reap ( particularly the old market) has several Indian restaurants that serve Vegetarian Thali ( costs between $2.5 - 4) , Naan, Roti and Tandoori dishes.The Veg Thali consists of either Naan / Roti with Yellow Dal, Rice, Veg curry and Aloo palak ( Almost every restaurant serves the same stuff - so much for differentiation !). Be prepared to wait for at least 20 mins since they start cooking only after you order. Little India : Is located opposite to blue pumpkin in the Old market. Its quite inexpensive ( Thali is just $2.5) and adequate. Its one of the oldest Indian restaurants and I would rate it 3/5 ( Please remember that my expectations of food are quite basic and I always set the right expectations when on travel). Currywala : Is located on the main road of Old market . The food was quite good here and they prepared it quite fast too. Its slightly expensive ( Thali is $4) but worth the price. I would rate it 4/5. Taj restaurant : Is opposite to the Provincial hospital and is run by a Bangladeshi. The food was quite OK ( the curry was stale) . I would rate it 2.5 / 5. India Gate : Is opposite to the Cambodia national bank building. The food was quite OK ( The rice wasn't cooked well) but the other items were nice. I would rate it 3/5. Maharajah : Is in the street opposite to Provincial hospital. The food was a bit spicy although the owner was quite attentive and friendly. I would rate it 3/5 . 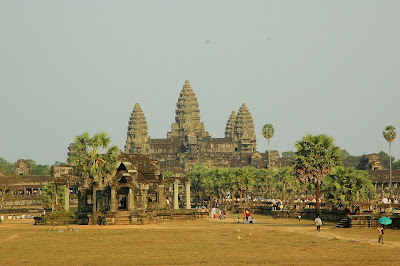 Angkor Wat : Angkor Wat is the reason why most tourists flock to Cambodia and its easy to understand why. Its an amazing mix of Spirituality, architectural beauty and grandeur. Angkor Wat was built in the 12the century and is dedicated to Lord Vishnu. There is huge moat of 1.5km by 1.3 km surrounding the temple. When you step into the inner causeway, you are awed by the spectacle in front of you. The walls are all filled with the Bas reliefs from Ramayana, Mahabharatha and other Hindu epics . Unfortuntely, most of the statues have been damaged or ransacked . Sunrise ( At front entrance) or Sunset ( at rear) is a great time to be at Angkor Wat. The crowds are lesser in the afternoon. If you are a discerning tourist, you would at least need half-a-day for the Angkor Wat complex. Its a photographer's delight. Recently, " Night lighting" has been introduced at Angkor wat and I would highly recommend that too. The temples are illuminated with color lights and look absolutely stunning. You can buy a 1 day or 3 day ticket for Angkor temples that covers most of the popular temples including Angkor wat and offers you unlimited visits. Tickets are available at the entrance to the archaeological park. The tickets for " Night Lighting" are separate ( The night tickets can't be purchased at the entrance of Angkor wat , so beware of this fact. You need to purchase the "Night" tickets near the museum). Bayon : Bayon is the most prominent temple in the walled city of Angkor Thom. It has 216 giant Avalokateesvaras that stare at you from everywhere with an enigmatic style. These faces bear a more than striking resemblance to Jayavarman VII who built the temple. Its a very unique temple that is also blessed with excellent Bas-reliefs. Baphuon : Right next to Bayon, this temple is mostly in ruins now. Its supposed to be dedicated to the mythical Mt. Meru. Phimeanakas : Next to Baphuon, it once housed the royal palace. However, not much of it is left now. Terrace of Elephants : Close to Bayon, this was used as a viewing stand during the royal days from where the King watched the processions. Elephants adorn the entrance of this terrace and hence the name. Terrace of Leper King : On a pedestal, this terrace has the statue that is an enigma to most historians. The statue is believed to be that of one of the Khmer kings who suffered from leprosy. Prasar Suor prat : Beautilful brick buildings opposite to Elephant terrace that were the home of the rope dancers in the royal days. Ta Prohm temple : One of the most " Junglee" temples, this temple is an example of how the Jungle has swallowed the temple. The roots of the trees have penetrated the inner and outer walls of the temple and is an amazing spectacle to watch. Phnom Bakheng : Its a hill near Angkor wat and has ruined temples. Phnom Bakheng is one of the best places to see the sunset view of Angkor Wat. Unfortunately, every tourist in town knows this secret and the place would resemble a circus during the evenings with everyone jostling for a spot for their camera. Its a 15 min uphill climb to the top or you can take a Elephant ride. My advise is to either skip the hill or to go there a little early and start climbing down when it starts to get crowded. Pre-Rup : A pyramid shaped temple , its made of red bricks and was the royal crematorium during the Angkor period. The sunset view over the verdant rice fields are a sight to watch. Banteay Srei : Is one of the most spectacular temples in the Angkor region. Its got the best stone carvings in the entire Ankgor region, and its pinkish hue stone color adds to the beauty. It is supposed to have been built by women. The carvings are extremely intricate and feature the Ramayana and other Hindu gods. Do not miss this temple ! Eastern Baray : This was a reservoir during the Angkor period and has a small temple in the centre. Ta Som : Is yet another temple that has been subsumed by the Jungle. Preah Neak Pean : Is a Buddhist temple that has a huge pool surrounded by 4 small pools. At the centre of the pool, is a temple dedicated to the Nagas (Snakes) and features a strange mythical " flying horse". This place would have been a wonderful sight in the 12th century with water flowing across all the pools ! Preak Khan : It is one of the largest temples in Angkor and was used as a temporary residence by the King when the city of Angkor Thom was built. Its maze of corridors , carvings and the huge Linga are quite impressive. Preah Ko : This temple belongs to the Roulus group of temples and is located 13km to the east of Siem Reap. The three Nandis are the most impressive of the structure in this temple. There are elaborate inscriptions in Sanskrit in the doors of this temple. Worth a visit on the way to Bakong. Bakong : The view of the temple from the entrance is awesome ! This temple is a representation of the mythical Mt.Meru and is shaped like a huge pyramid. The moat in this temple is the best in the region with an amazing view . Lolei : Features a buddhist monastery now and lies close to the Bakong temple. The temple is in complete ruins and very little is left in it. Tonle Sap Lake / Chong Kneas Floating Village : Tonle Sap is a huge lake that borders the town of Siem Reap. The Chong Kneas is a floating village in it that has started attracting a lot of tourists. The path to the floating village can be a bit rough. After parking the vehicle, there is a 1.5 - 2 hrs boating tour. Be careful and negotiate the price for the boating ( I bargained and ended up paying $15 / person / 2hrs in a 2 seater boat). The floating village of Chong Kneas is fantastic and features Floating schools, churches, and shops. The boats stop at a fishing farm ( where one can see the Siamese Crocodile - now almost extinct on the Tonle Sap lake) and at Gecko center - a small environment center. Its a fantastic experience and I would highly recommend this floating village tour. Prek Toal Biosphere : Its one of the best bird sanctuaries in Cambodia and has birds such as Storks, pelicans, darters, and egrets. Its a one-day trip from Siem Reap and an NGO called " Osmose" arranges a day trip to this place. Be there either early in the morning or during late evening for best views. The trip costs $60 / person ( incl Transport, Food, entry fees and guide) . SHOPPING : Cambodia is a great place for shopping. Its famous for silverware, paintings, T-shirts, handicrafts and stone carvings. The old market and the night market ( in the Old market area) are great places for shopping. Be prepared to bargain ( sometimes starting at less than half of what is quoted) if you want a good deal. I would advise not to buy stuff near the tourist places as they tend to be expensive. MISC : If you want to relax, get yourselves a massage - body/ foot. I got myself a 1hr foot massage which was quite rejuvenating. Cost me $ 4 / person. Is Cambodia safe to travel ? If you stick to the tourist trail, Cambodia is pretty safe to travel . However, the rural areas are still dangerous due to the land mines that have never been unearthed. Siem Reap is extremely safe with a huge group of tourists who flock there year-round. How much would a trip cost ? I went for 4 days to Cambodia from Singapore. I am a budget traveler ( I rarely stay in fancy 5 star hotels nor do I rent an expensive car to drive me around) who likes to backpack and travel with crowds. It cost me US$ 500 or Rs. 20000 / person for the whole trip ( Includes Air travel, local transport, Accommodation, Temple entry fees, Food, Shopping , Departure tax , Visa fees, Misc ). Do they speak English there ? Most locals know a smattering of English that is enough for simple conversations. I didn't find the language to be a major issue. I had planned my trip well in advance and had the " Lonely Planet" guides and maps to tow me around. So the bottomline is, if you plan well , you should be able to manage. Do I get Indian Food / Vegetarain food there? Yes. I had already written reviews about the Indian restaurants in the "FOOD" section. But getting Indian/Veg food might be a bit of challenge ( not impossible) once you move away from Siem Reap. FINAL WORD : If you love history, culture and architecture, you shouldn't miss Angkor Wat . Its a celebration of the spirit of mankind and is a crowning glory in the architectural history of this planet. One needs to be a discerning & Open-minded tourist to appreciate Cambodia. I had a great time at Cambodia and would highly recommend it for everyone. The New York Times writes a long piece on Mukesh Ambani - his evolution as India's foremost businessman, his working style and vision for India. Not a lot of what is written is new, although Mukesh's strong "Indianness" might be a bit surprising for many readers.However, the article does go a little overboard with constant camparisons to Mahatma Gandhi. Reader's Digest - Will they practice what they preach? I subscribed to the Reader's digest magazine since the start of this year. As most people would know, RD is one of the most popular general interest magazine in the world with local editions covering a range of topics that often feature humanity, individual empowerment and social responsibility at its core. I was rudely shocked when I started receiving " sweepstakes" spam letters ever since the start of my subscription. For a magazine that writes so much on the need for a green world, the amount of junk mails ( not email) that they send is staggering. I am now searching for an "Opt-out" clause from these junk mails and this whole episode has lowered my respect for RD as a publication. Will they practice what they preach? I saw the movie Sarkar Raj last week. My verdict : Its not a bad movie, but somehow lacks depth. I liked Sarkar slightly better (despite the blatant inspiration from "Godfather"). Ram Gopal verma ( RGV) , the film's director and a recent blogger has taken the fight to the critics. In a frank and aggressive blog post, he has questioned the credibility of the film critics. I have never seen such a personalized and caustic response from any film maker yet. So are our film critics (as RGV has suggested) truly qualified to critic films ? Unfortunately, the truth is most critics in India lack the experience / love for cinema to be good critics and the rest are purely biased due to various reasons. In Bollywood, there are more people who love the power & limelight than the craft of film making. So the critics are just part of a bigger problem - the lack of passion and love for art. Art for art's sake, anyone? I was recently invited to deliver the keynote speech at an IT Conference in Phuket, Thailand.After the conference was over, they had a team building exercise ( in the traditional Thai way) where all of us were given a specific thai musical instrument and asked to play a short musical piece together. I chose flute ( which I realized wasn't quite easy to play) and was given the "musical notes" to play. I looked at the notes and was voila! it was " Mohanam". The musical piece was unmistakably " Mohanam" with the notes " Sa Ri Ga Pa Dha Sa" all over it. I knew that Mohanam was quite popular in Japan ( Is that why Shankar-Jaikishan composed the song " Sayonara" from the movie Love in Tokyo in Mohanam?) & China ( Here is my earlier blog post on that). I further learnt that Mohanam is extremely popular in Thailand and even their National Anthem is based on the same raaga. I became a mini hero at the conference after I delivered a short speech on " Mohanam" and its cultural influence in Asia ! Its a small world. Blogging seems to be the latest buzz in bollywood. After Aamir Khan & Amitabh , its the turn of Ram Gopal Verma. So would he be a maverick in the blogging world too?